Walk through our front doors and you'll know you're in for something special! With Italian marble floors and decorative columns, hand-painted murals, contemporary lighting, and an abundance of cherry wood, the lavish decor is just the beginning. The Cheesecake Factory is a unique, upscale casual dining restaurant offering more than 200 menu selections including Appetizers, Specialty Salads, Pastas, and Pizzas, as well as great Steaks and Burgers, Sandwiches, Fresh Fish and Seafood. Be sure to save room for one of our 40 delicious cheesecakes and desserts with a cappuccino or latte. You Can Have Your Cake And Send It Too! A selection of their most popular Cheesecakes can be shipped almost anywhere in the U.S. via Federal Express! Shop Online or call 1-800-330-CAKE - 24 hours, 7 days a week. National Gift Card is the best place for you to order The Cheesecake Factory gift cards in bulk. We are the experts in all things gift cards and can set up your gift card solutions program for you today. Please contact us for more information on bulk, direct-to-recipient, or individual gift card fulfillment for your gift card program. Contact us here or call us at 888-472-8747 today! 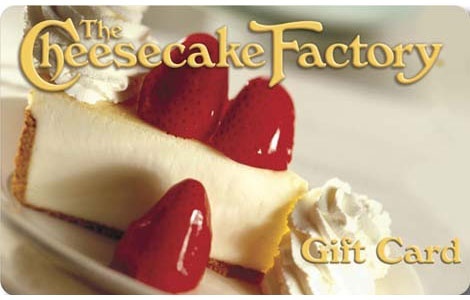 Redeemable at all The Cheesecake Factory restaurants nationwide and online at www.thecheesecakefactory.com. No limit on the amount of cards that can be used online. Lost or stolen cards will not be replaced. For balance inquiries, call 1-888-891-2429 or go to www.thecheesecakefactory.com. The Cheesecake Factory Incorporated, its affiliates and subsidiaries, are not affiliated with NGC and do not endorse, sponsor, approve or have any responsibility for this promotion. The Cheesecake Factory(R) and The Cheesecake Factory logo are registered trademarks of The Cheesecake Factory Assets Co. LLC. The Cheesecake Factory gift cards are not valid in the state of New Mexico. A prepaid card redeemable at all The Cheesecake Factory restaurants nationwide and for online purchases at www.thecheesecakefactory.com (No limit on the amount of cards that can be used online). Lost or stolen cards will not be replaced. For balance inquiries, call 1-888-891-2429 or go to www.thecheesecakefactory.com.